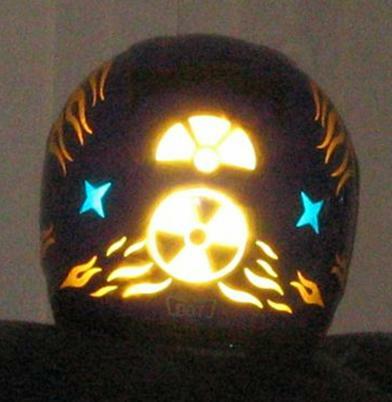 Streetglo Reflective Helmet Decals Motorcycle Graphics Suzuki C50 Kawasaki Vulcan Classic 1500 Decals. Streetglo Customers Show off their Stuff! Ultimately Cool, Outrageously bright at night! Send us your photos and comments. Don’t be shy! 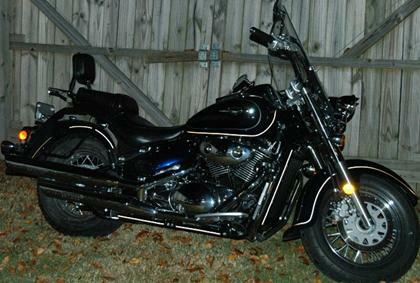 Being a new rider, I had concerns about being seen by other motorists, particularly at night time. I had a plain silver helmet and wanted to put something on it to make it more visible. I came across the streetglo.net website and was impressed by their product line. 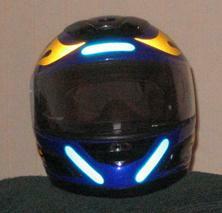 I contacted them and ordered the reflective Speed-Stripe helmet decals. 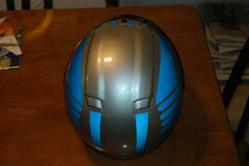 Although designed for a full face helmet, I easily modified it to work on my 3/4 helmet. Just a little trim work and it turned out great. Not only did it do a lot to improve the looks of an otherwise plain helmet, it is much more visible when light hits it. I also ordered reflective pinstripping and did some outlining on my bike. I am very confident that this has made me and my bike more visible. Great products, and great people to deal with." Streetglo: Thanks Kelly, We appreciate a comment like that! Makes us feel all cozy inside. P.S. You did a great job with the reflective helmet decal installation. I received my StreetGlo order 4x Flame Accents design sheets in Green, Gold Red and Yellow. Delivery to Australia was 1 week from the time I ordered them (and I live in Australia too). Anyway, I attached a number of pictures from start to finished product on 2x BMW System 4 Helmets and the end result was better than I expected. I didn’t want to completely dazzle some poor sucker that sees the helmet at night, so I subsequently decided to use smaller decals. Anyway, view the end result and judge for yourself. It is still VERY BISIBLE but not distracting! I thought that this hint may help. I printed out a paper copy template of the flames, cut them out so that I had 4 matching colors in templates. I then laid the paper cut flames on the helmet until I found the designs and combinations I liked before actually installing the flame elements on my helmet. Again, many thanks and I have happily recommended your site and products to those that have enquired on seeing the helmets. Ross, your design really shows how creativity can be better than ready made decals. We would have never thought to do this, but you gave us some really cool ideas. We might create a kit based on your design and claim the creative credit as our own (Just kidding). Great Job Ross! 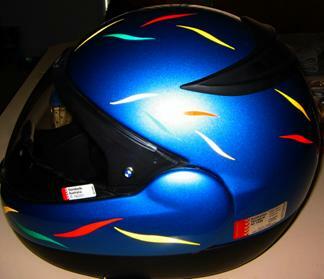 SEE REALLY COOL HELMET DESIGNS using left-over pieces from our decal kits. 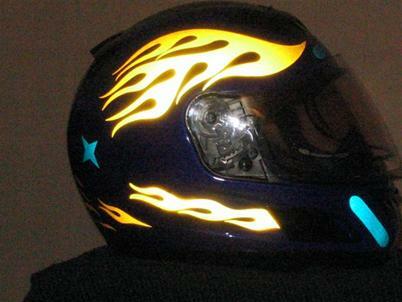 Products Classic Flames reflective decals, Extra Graphics included with the Speed Stripe reflective helmet decal kit, Flame Elements reflective decal, 1 Radio Active Outline reflective helmet decal and 1/2 of a Radio Active non-outline reflective decal. . Finally got around to making the helmet up. I am very pleased with the results. I'm not a "designer" but am happy with what I put together. It will certainly stand out on the city streets at night and it will also be much more visible during daylight. It was very easy to apply the decals because I followed your instructions. 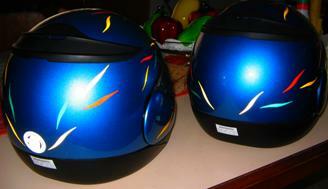 I used rubbing alcohol on my helmet as the final cleaning agent. I found that my final clean with the gauze pad soaked in rubbing alcohol had the added benefit of keeping my fingers "dry and oil free". The "glo" is great. Am going to put some on my bike and the new helmet I ordered. Great product. Thanks again for sending. I'll be praising the glo of streetglo around this city! The pictures don't do it justice. 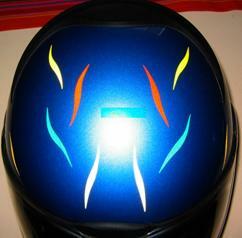 Streetglo: Rob, You captured a magical and mystical look with your combination of reflective helmet decal elements. We especially like the reflective graphic design on the rear! We agree, our reflective helmet decals are very hard to photograph. The secret is to photograph outside on in bright lights with forced flash for day shots and in shade or at dawn for night appearing shots. The reflective helmet decal stock is simply too reflective for good night shots unless you have an extremely wide range camera.